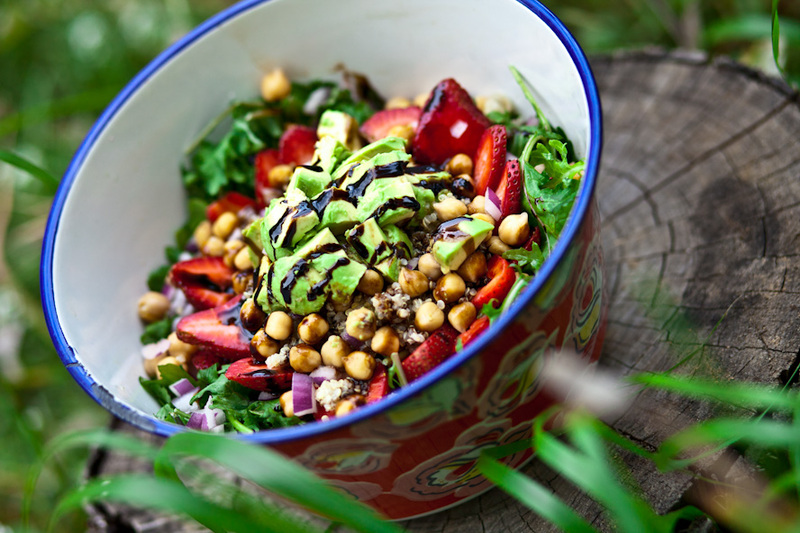 Spring has arrived and to celebrate, we created this Strawberry Kale Salad! It is light yet filling, a nutritional powerhouse filled with superfoods, fiber, and protein. Yum! People often wonder how vegans get their protein. Well, I’ll tell you- it’s from plants! Many plants, especially beans and legumes offer plenty of protein. Plus, the amount of protein humans actually need has been greatly exaggerated. Check out the diet of a gorilla! They have a 95% vegan diet (supplemented by the occasional bug) and they are one of the strongest mammals in the world! This Strawberry Kale Salad gets its protein from chickpeas, a vegan staple and one of my favorite foods. In a large bowl, toss the baby kale and red onion with olive oil and salt and pepper to taste. Massage the oil into the kale with your hands for 5-10 seconds to evenly coat and soften the leaves. Add the quinoa into a large scoop in the middle of the salad, Drizzle the lemon juice on top of the quinoa, then top with the chickpeas and avocado. Arrange the strawberries around the bowl, or simply sprinkle on top . Add the balsamic drizzle onto the salad. Toss just before serving. This Strawberry Kale Salad is quickly becoming one of my spring staples. Although, I’m pretty much obsessed with anything that pairs strawberries with balsamic. I just can’t get enough! The kale and quinoa send it over the top. Now if you’ll excuse me, I have a salad to devour! For other tasty salad options, check out our Roasted Vegetable Salad and our Pomegranate Persimmon Salad.